Our new PTSF-23 greenhouse designed for hydroponic tomato production, with a truss system that can hold the weight of vine growth. Generally, it is too expensive for regular crop production, so the other models would be better choices, to provide an economical cover for your crops while giving you the peace-of-mind of a strong, engineered greenhouse. The heavy-duty, galvanized, bolt-together frame features predrilled components that allow the house to go up quickly and accurately. 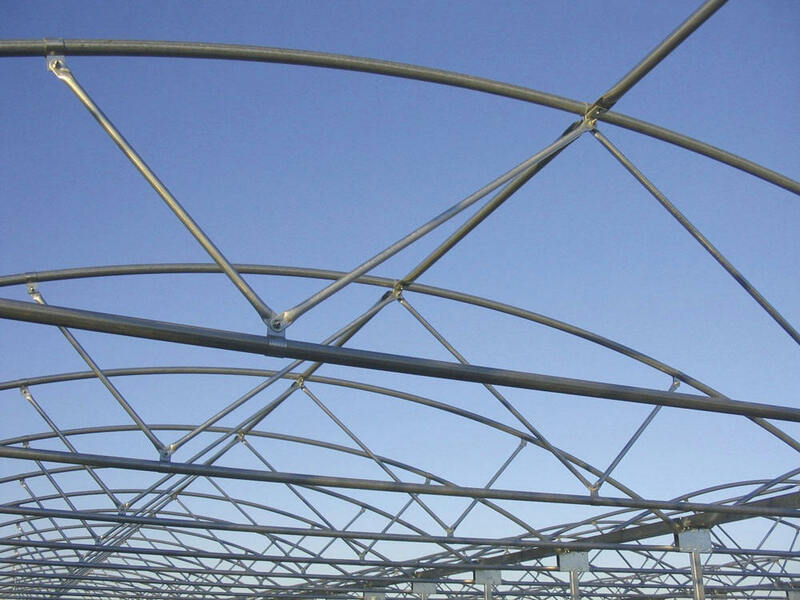 The result is a structure that will reduce your on-site construction costs while providing a strong, versatile greenhouse that easily adapts to most climatic conditions across the country. Bolt together: Comes ready to assemble from our factory to save you time. Heavy-duty: 2" x 3" x 14 ga. galvanized steel tubing with welded steel base plates. Three sidewall heights: Choice of 8', 9', or 10-foot sidewalls to best suit your growing needs. Height at apex: 8-foot sidewall: 11'-3" ,9-foot sidewall: 12'-3" ,10-foot sidewall: 13'-3"
Truss height: 8-foot sidewall: 7'-4",9-foot sidewall: 8'-4",10-foot sidewall: 9'-4"
Roof cover: clear or white 6 mil. UVI treated polyethylene. What types of crops are suited to grow in the PTSF-23? 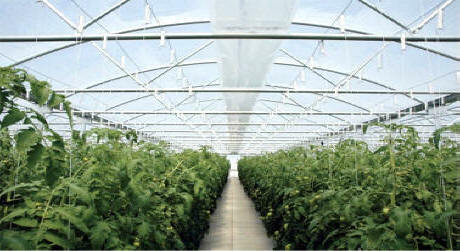 The PTSF-23 commercial greenhouse excels at growing many different crops. From annuals to perennials to vegetables, the SF-23 can be configured in different sidewall heights and with different crop load strengths to satisfy almost all growing requirements. Ventilation, heating and cooling can all be configured to match your needs. I live in Montana. Is the SF-23 going to hold up in my snowy winters? The PTSF-23 has been engineered to stand up to most snow loads in the lower 48 states. We have installations in Idaho, Nebraska, and Minnesota. What are the advantages of a double poly roof and sides? 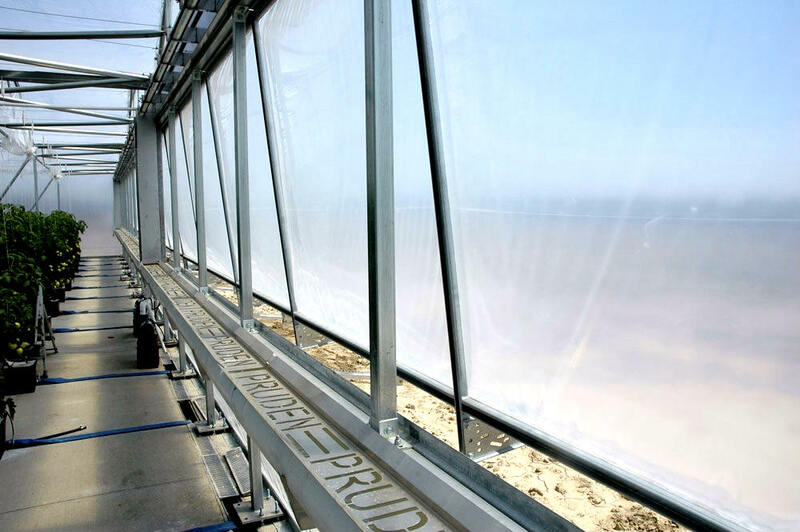 Inflating two layers of poly film will give you a tighter layer that will flap less in the wind and therefore will last longer. It will also give you a dead air space that will help to insulate the greenhouse. We recommend a double poly roof and sides for anyone in a colder climate. Can I assemble the SF-23 by myself? Yes you can. It comes pre-drilled from the factory and is ready to bolt together on top of your concrete pad. We do suggest some experience in greenhouse setup and construction. If you are unsure or if you would rather have someone else do it, give us a call and we can give you some recommendations. Why would I need the optional horizontal end truss? The horizontal end trusses strengthen the end walls for growing heavy crop loads such as tomatoes and other climbing plants and vegetables. This allows you to place climbing strings anchored over the trusses to maximize growing space and yield. 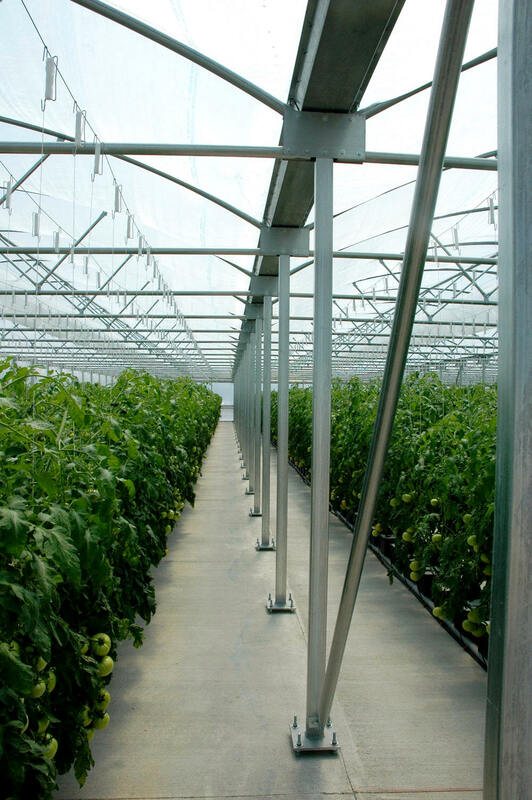 Choose from our wide selection of gas, electric heaters, Greenhouse Heating will keep temperatures in the greenhouse at a reasonable level in summer time. Choose from our aluminum, PVC evaporative cooling systems and 4" or 6" pad thickness. You can choose open top. Open design allows for easy detection and cleaning of clogged holes in the distribution pipe. 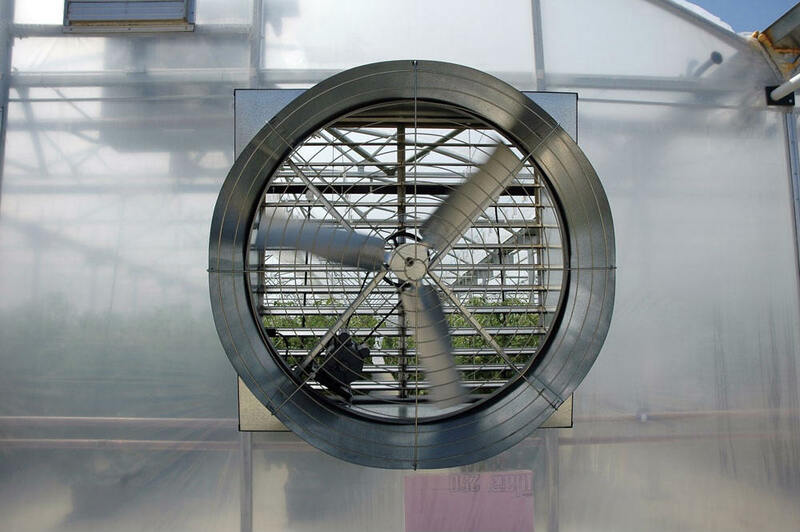 Circulation fans provide constant air circulation within the greenhouse space. Helping plant health by reducing disease caused by condensation on plant leaves.